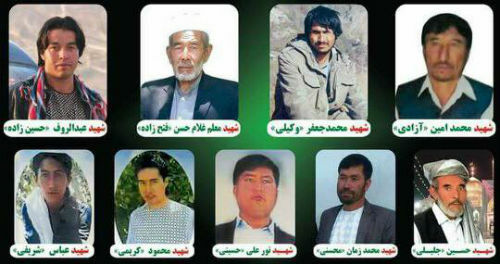 For past several months, eight Hazara residents of ‘Takhta’ village, district Qarabagh, have been kidnapped over Water Issue by Pashtun residents of nearby village known as ‘SherAbad.’ The relatives of the kidnapped, and notables made every effort in reaching Afghan Government, as well as the Pashtun elders, but instead nine Hazara notables of villages Qara-chee, Jangalak, Toji Qarya, were brutally killed by the kidnappers allied with Taliban terrorists. During this time, the role of two dominant groups –Kabul Government and Taliban– requires a closer look. Whereas the Taliban terrorists completely supported their Pashtun-kin that kidnapped the Hazaras, the ARG Afghan (Presidential Palace) –with a long fascist history– remained completely silent and distanced from the crisis. Recently, the crisis took another turn after armed men attacked the kidnappers, killing two of them and detaining another two. Suddenly, the otherwise completely silent Afghan Government sprang into action. The Pashtuns, siding with their ethnic-kin, blocked the Kabul-Qandahar highway, whereas the Afghan government sent a delegation to Qarabagh. This one-side urgency was widely noted by Hazaras as the Government took no steps for resolving the unfolding crisis, nor played any role in the release of the kidnapped Hazaras, instead urging them to pay Taliban commander, Mullah Daru Khan, for the release of the kidnapped. The Qarabagh crisis is yet another example of the Afghan Government playing ethnic favoritism and making every efforts to create a wider rift among the different ethnic communities like it has been doing with the Kuchi – Hazara conflict in Behsud. Note: The Kuchis (‘nomads’) are sub-tribe of tribe of President Ashraf Ghani Ahmadzai. The conflict between Kuchi and Hazaras dates back to 1890s when the Pashtun ruler of Afghanistan, Amir Abdur Rahman Khan, decimated the Hazara population by exterminating 62% of the entire Hazara population, while selling tens of thousands of Hazaras as slaves to defray the cost of the genocide. The Kuchis ‘right of passage’ (grazing rights for their livestock) is given by same Pashtun ruler. Annually, heavily armed Kuchis graze their livestocks on Hazara lands, intentionally creating a conflict, and then loots and plunders the villages with the help of its Pashtun Sunni Islamist forces such as Taliban. March 17: General Murad Ali Murad, representing Kabul Government, brokered a deal between the Pashtuns (their Taliban ally) and Hazaras in the Qarabagh ciris. Following the deal, the kidnapped Hazaras from Qarabagh area (held for last 7 months) have reportedly been released. It is unclear what concessions the Afghan Government has made to the Taliban terrorists for release of the kidnapped Hazaras. The Pashtuns, with the help of Taliban, killed 9 Hazaras initially, and two more Hazaras were killed on March 8, 2018. Below reads: The conflict on water was between Pashtuns and Hazaras in Ghazni. The Afghan Government has ignored the Hazaras, while fully attentive to the side that represents his ethnic kin. What do you say to this?